We have a 1 year old female sable. She is a consumer of things inside: cushions, et al. In any case, that is not the primary problem - we installed a split rail fence with vinyl coated mesh. The mesh is at a minimum of 50" to a max of 56". For three months, she was fine in the fenced in yard (my wife and I work outside the home). Last Thursday, the neighbors found her outside the fence - thought we might have left a latch undone. Long tale short, she has gotten out every day since. We have inspected the perimeter and there are no obvious egress points. Can this sweet girl be clearing 50"+ with no obvious landing points ? She has no formal training in skills. We need help with this Houdini. Clearly, invisible fence is the next logical progression but any intermediary suggestions are most welcome. 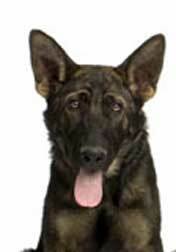 Total German Shepherd: Your highly intelligent sable German Shepherd puppy is bored and needs exercise and training. Once you fix those issues you'll have much fewer problems. And the fence jumping - even at that height - easy smeasy for a German Shepherd puppy with the right reason to jump it and that knows she can do it. Again, another reason you need to train her - to not jump the fence. 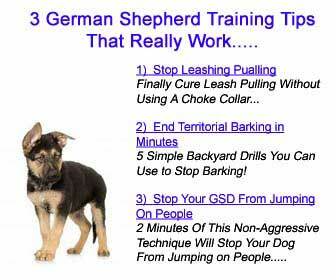 So, in response to your issues I'd have to say they're all fixable with proper dog training. So I would suggest you sign up for a dog training class asap. And if you want a great course to get started in the meantime I would definitely suggest you check out either of the banners you see on this page for more training advice. Just click to learn more.